44 episodes and still counting. Very soon Kamen Rider Den-O will soon to end. As of now I'm still stuck to episode 26. Thanks to work, weekend gimiks and Heroes I remain preoccupied but I didn't miss the chance to get a copy of the episodes in TV Nihon. Because of the current status of American TV series, I think I will be going back on watching Den-O. Next year, another warrior is already set to grace your TV screens (or computer screens). Toei already announced the new Masked Rider.of year 2008. They call him Masked Rider Kiba. 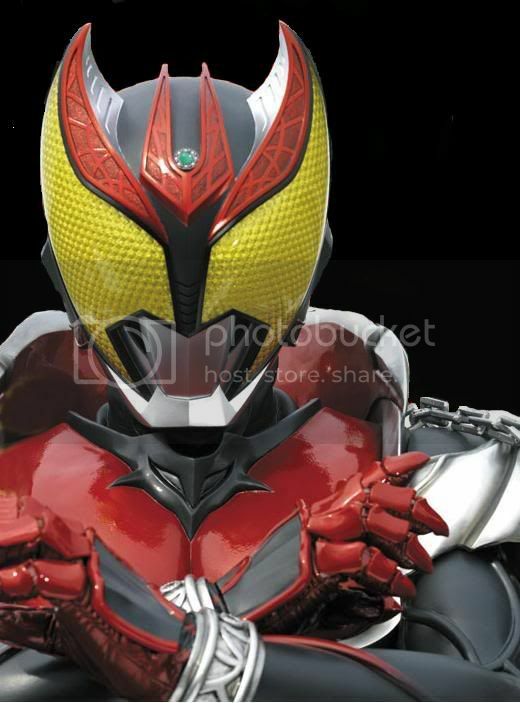 The studio already released the very first clear shot of the rider and it seems it has a remnant of Rider Ryuki and the color scheme of Faiz. According to message boards and unoffical fan sites, Masked Rider Kiba's motif is based on American monster myths thus giving sense to the rider's name which means "Fang" when translated to English. In another leaked scanned images, it appears Kiba possesses three forms (or more). The Vampire form, Frankenstein form and Werewolf form. It seems that the Masked Rider franchise is sticking to the single rider + multiple form format. Still watching out for the ending of Den-O and excited for the next Rider's arrival.